Oklahoma Indian restaurants like their counterparts in Dallas, Plano and Houston are big on lunch buffets. 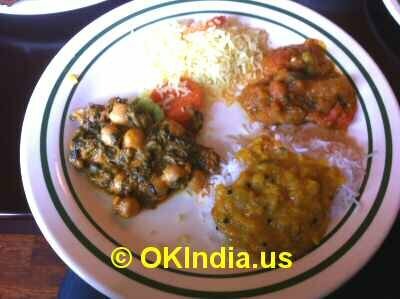 It's unusual to find an Indian restaurant in Oklahoma towns like Tulsa, Oklahoma City and university town of Norman that does not offer at least a lunch buffet. Whether you're a fist timer or a veteran, the best route to Indian cuisine is via a buffet. Indian buffet meals not only provide an opportunity to taste a variety of vegetarian and meat dishes but also offer excellent value for money. Indian lunch buffet price usually ranges from $8.99 to $10.99. Oklahoma Indian buffets usually include a variety of items from appetizers like Pakora, Uttappam, Medhu Vada, Idly and Tandoori Chicken plus entrees like Chicken Tikka Masala, Paneer Masala, Lamb Vindaloo, Chicken Curry, Dal Makhani, Mixed Vegetable Curry, Alu Baingan entrees, Gulab Jamun, Gajar Halwa, Kheer, Rasmalai desserts and naan bread and rice dishes.